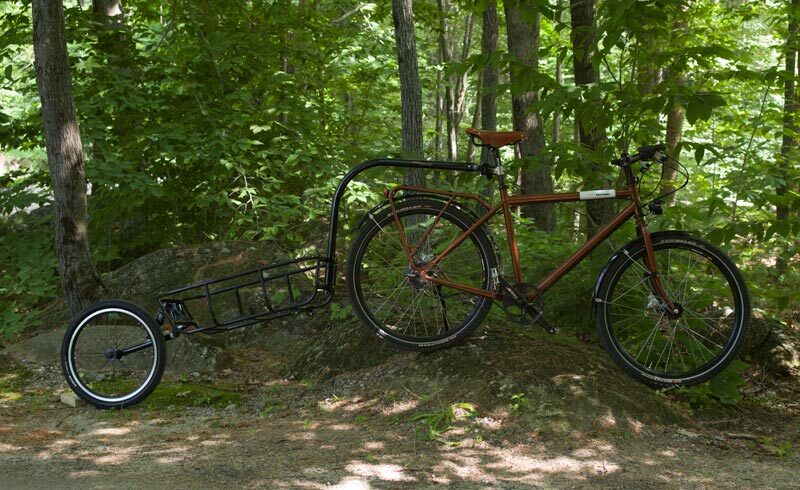 The Mule is a wonderful trailer for off road touring. 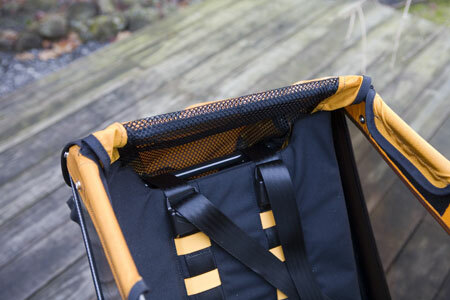 Designed to carry up to 35kg - 77lbs of stuff, even over rough terrain. 160mm of suspension travel makes it easy to pull your stuff over just about anything a sane person would ride a bike over. The rear suspension has two positions. Shown here, it's set up for riding smooth roads. 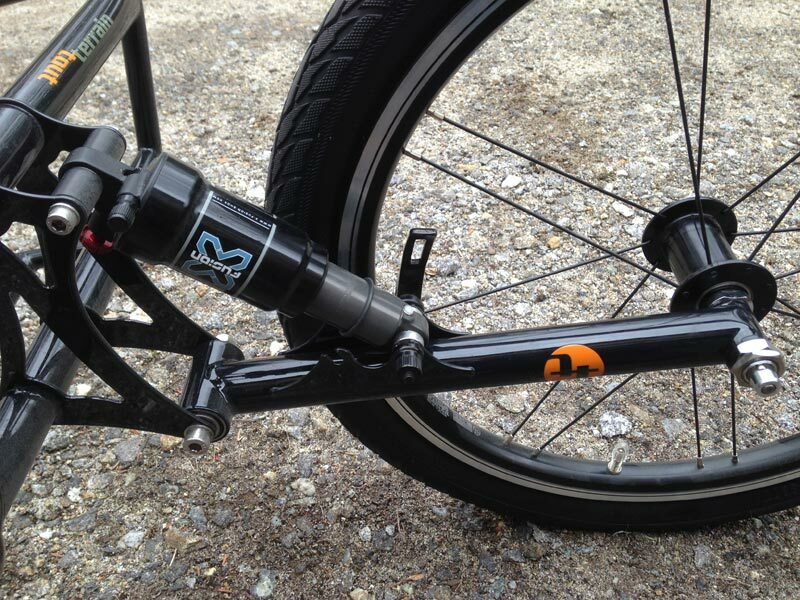 But notice the forward position for mounting the bottom of the shock? Move the shock there and the the Mule is raised up for rough trail riding. Here the suspension is set for smooth dirt or paved roads. 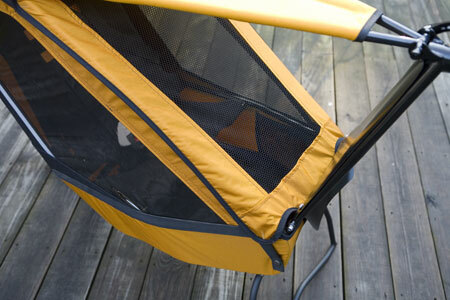 The Liner is an optional accessory that attaches to The Mule with heavy velcro straps. The liner installed. 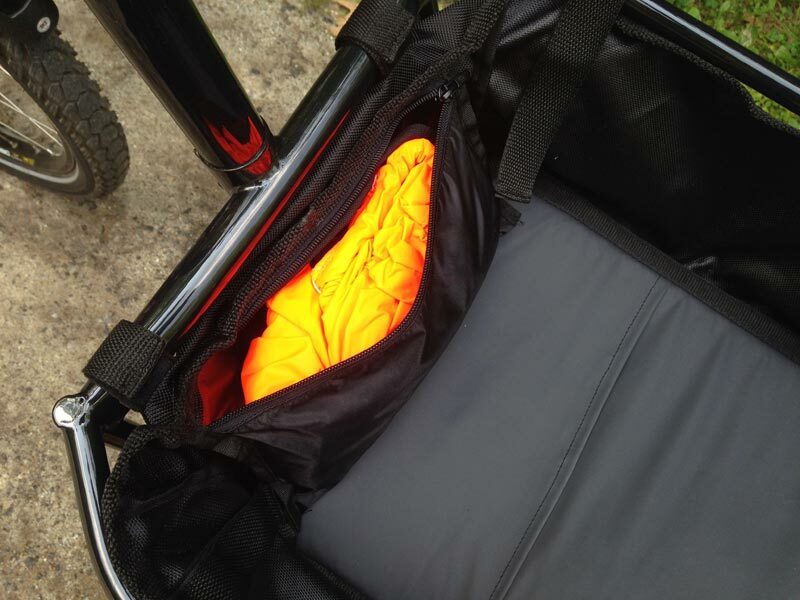 The bottom of the liner is padded, to help protect your stuff. In a forward pouch you'll find the rain cover. To make the photos more exciting, I just grabbed some cushions from the living room sofa. Linda wasn't pleased. Here the cover is draped over the cushions. Pretty exciting, eh? Perhaps not. But it sure is bright! 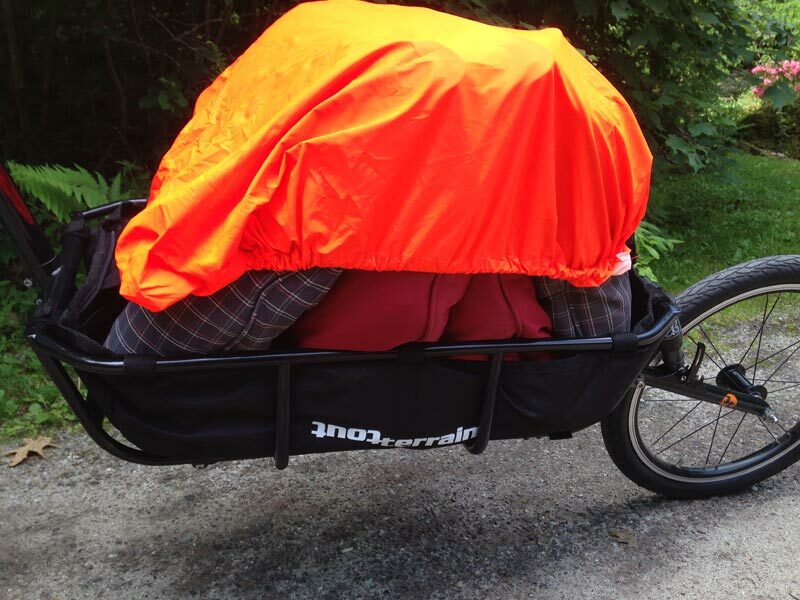 And here the rain cover is secured to The Mule with its heavy velcro straps. 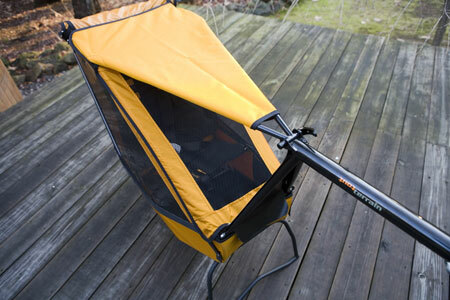 The Liner is not included with The Mule, it is sold separately. 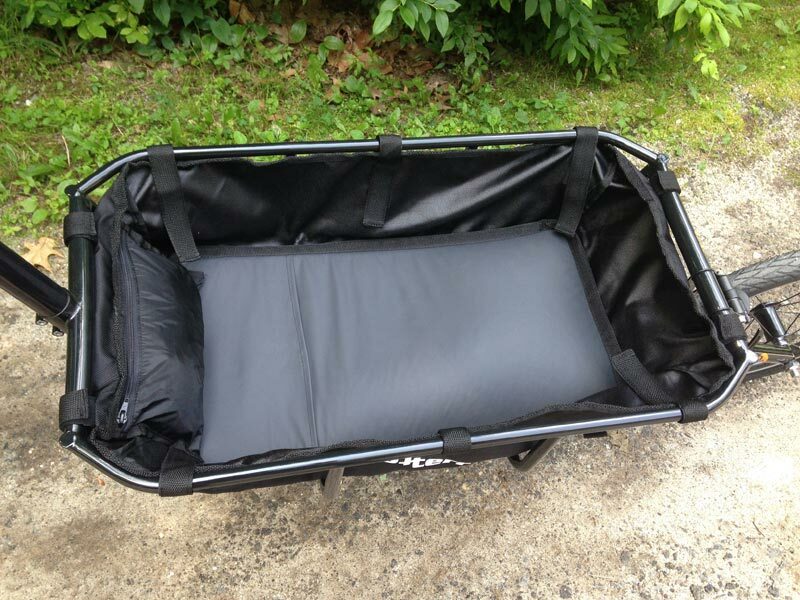 You can get the Liner with a stand to keep The Mule level when not attached to your bike and a fender for the wheel. It's called the "Accessory Kit for Mule". See below. 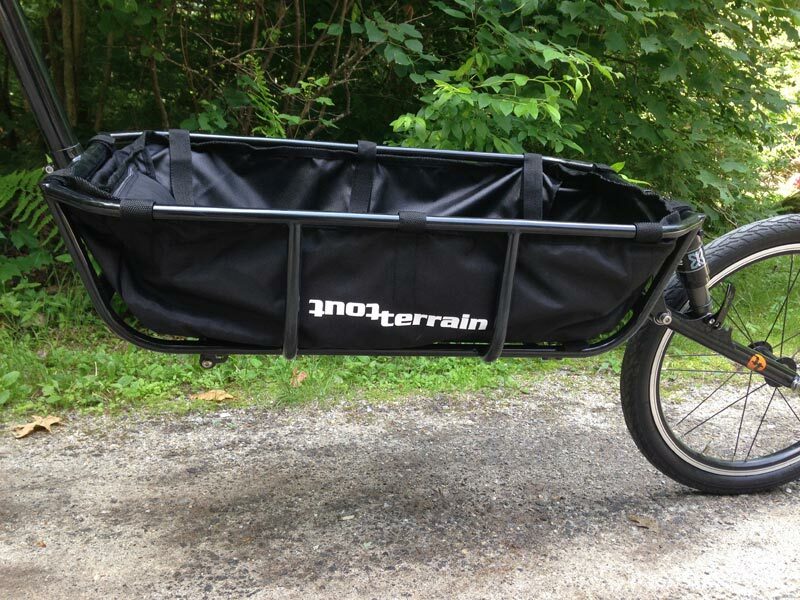 Tout Terrain trailers are now priced without the Seatpost Clamp. This is because there are so many seatpost sizes. So don't forget to include the cost of the Seatpost Clamp. 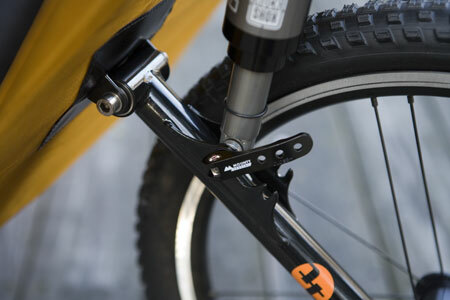 The Seatpost Clamp itself is made in two sizes, and accepts several sizes of shims to fit a variety of seatpost diameters. We have shims for 26.8mm, 27.0mm, and 27.2mm, which fit the 30mm clamp. When you buy the clamp, the shim size of your choice is included in the price. We have shims for 30.9mm, 31.4mm, and 31.6mm, which fit the 35mm clamp. When you buy the clamp, the shim size of your choice is included in the price. If you have two bikes, you can buy a second Seatpost Clamp and leave it on the second bike. These three shims all fit the 30mm clamp. These three shims all fit the 35mm clamp. 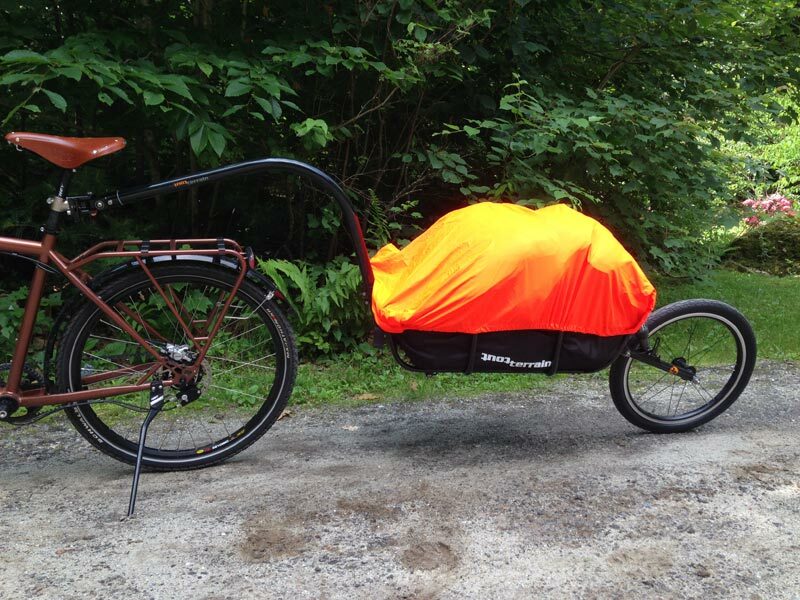 The Singletrailer uses suspension to keep your child comfortable when riding offroad trails. Great care is taken in the construction of the trailer to maximize safety. 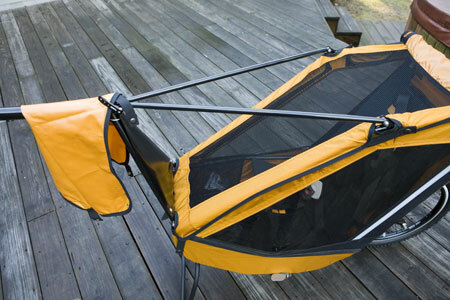 Your child will remain safe and dry if it rains. Even if your bike has no fenders, your child is protected from spray by the black plastic barrier in front. The side windows are thick plastic. There are reflective strips down each side and across the back. These photos were made in 2009. Since then the Singletrailer color is a lime green, rather that the yellow as shown. If there's a chance of rain, pull down and secure the plastic window. Your little bundle of joy will remain dry, except for the whole, you know, diaper thing. 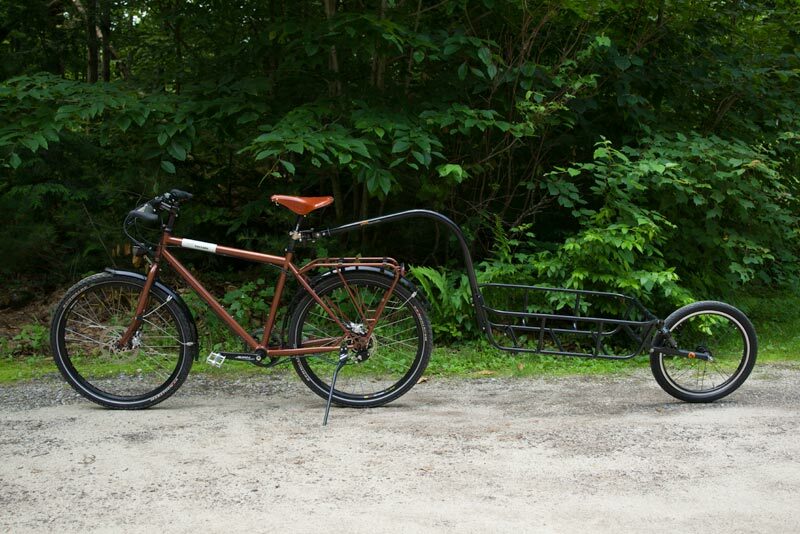 Just as with The Mule, the Singletrailer is now sold without the clamp. The clamp must be purchased separately. Isuro pillows protect the head should your toddler nod off. Sold as a pair, right & left. 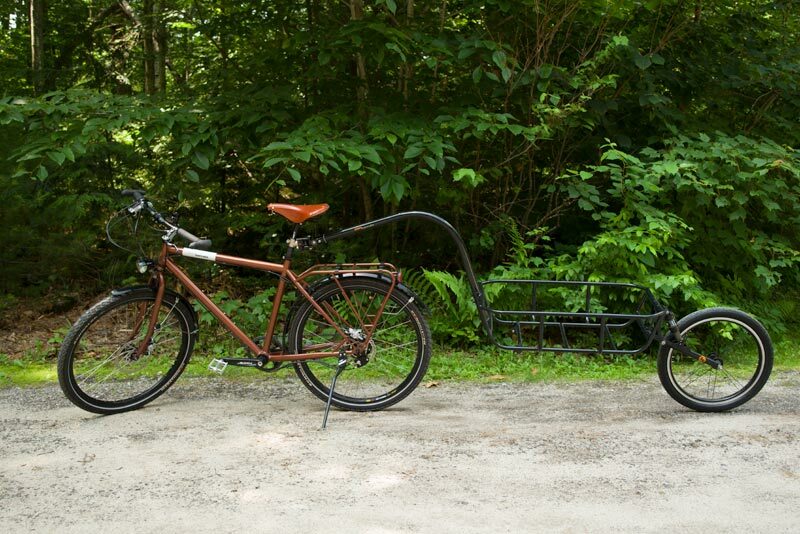 Peter White Cycles is the US and Canada importer for Tout Terrain. You can buy Tout Terrain products directly from us. Or, your local shop can get them for you from us. 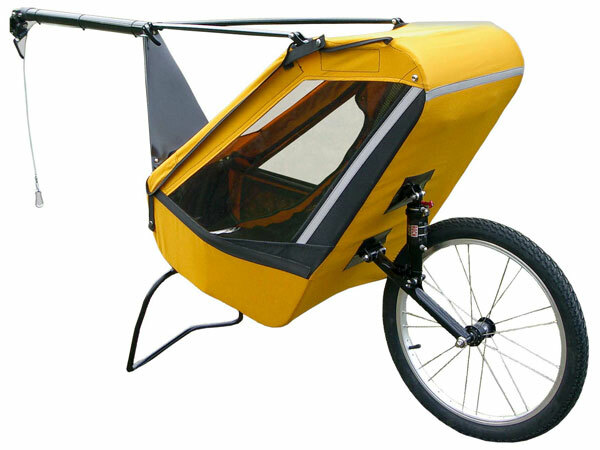 We ship to any bicycle shop in the US and Canada. 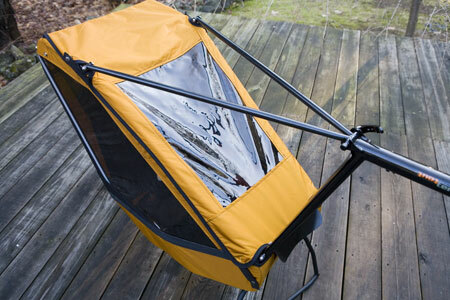 Almost all products on the Tout Terrain website which we don't keep in stock can also be ordered.